coating and coating with polyurethane and then grinding, turning or profiling in any desired size, contour or profiling. Polyurethaan Gieterij Nederland is the specialist in the coating of wheels, rollers and rolls with polyurethane. The polyurethane products can then be finished by us: grinding, turning and profiling. With this we can take care of any desired dimensioning, contour or profiling. With our advanced machinery we can make polyurethane wheels, rollers and rolls up to a length of 6,000 mm and a diameter of 1,100 mm, to specification with almost every operation. Depending on the application of the wheels, rollers and rolls, the composition of the polyurethane coating is determined. 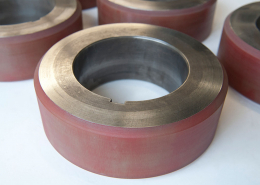 Think of wear, tear or cut resistance, mechanical load, chemical resistance and sliding properties of the rollers and wheels. We are happy to help you choose the right type of polyurethane covering. 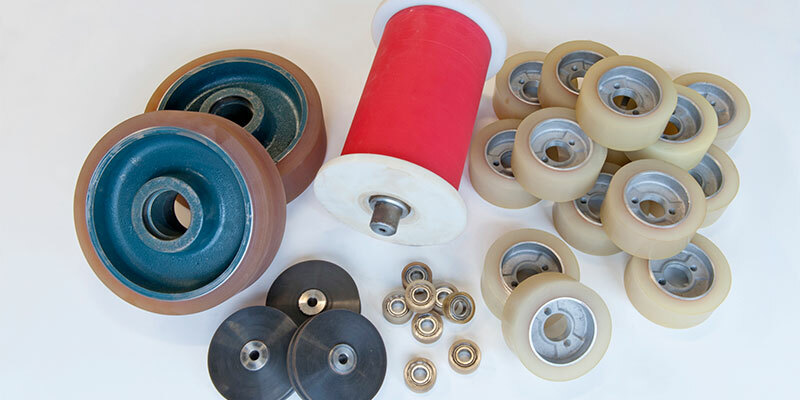 We can cover wheels, rollers and rolls with polyurethane according to your specific wishes and specifications. This can be done in both small and large series. More information about polyurethane wheels, rollers and rollers?